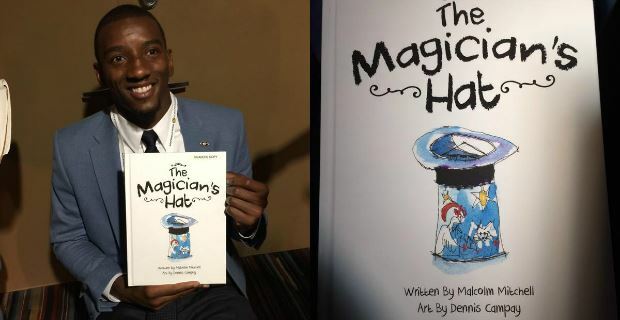 New England Patriots receiver Malcolm Mitchell is using his offseason time to inspire kids and teach them the importance of reading. He is currently promoting his “Read with Malcolm” literacy program as he travels to 12 different stops around the Boston, Cape Cod and Hartford area. During these events, Mitchell hosts “reading rallies” where each student is given a copy of “The Magician’s Hat,” a book that he wrote himself. Mitchell is joined by Steve Gross from The Life is Good Kids Foundation, and the two read the book to the kids. John Logan, a Patriots employee with a magician’s background performs tricks for the audience. Mitchell didn’t get into books until he was in college at the University of Georgia. His first book that he read by himself was “The Giving Tree” by Shel Silverstein. Now that he understands the importance of reading, he makes it a mission to teach kids the same.